ROMAN IMPERIAL. Arcadius (AD 397-402). AV plated AE solidus (20mm, 4.08g). Contemporary counterfeit of Constantinople mint issue. ROMAN IMPERIAL. Arcadius (AD 397-402). AV plated AE solidus (20mm, 4.08g). Contemporary counterfeit of Constantinople mint issue. 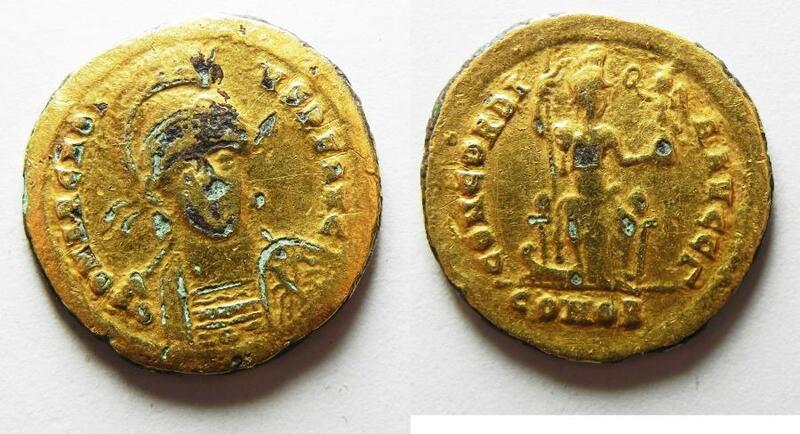 D N ARCADIVS P F AVG; helmeted and cuirassed bust of Arcadius 3/4 r., holding spear over shoulder and shield / CONCORDIA AVGG Γ, Constantinopolis seated facing, head right,right foot on prow and holding Victory on globe and spear; //CONOB. RIC 7; Depeyrot 55/1.